Indie games often slide under the radar, even when they’re brilliant — more so if they’re not part of a popular genre. So in the interest of making sure a gem of a game doesn’t go unsung, I thought I’d recommend the game that wowed me the most in 2018: Lucas Pope’s Return of the Obra Dinn. This game is a bit tricky to describe and even trickier to recommend. I know enough about the gaming community to know a brain teaser is not everyone’s preferred form of escapist entertainment. And Obra Dinn is, at its heart, a brain teaser. It’s a whodunit that refuses to hold your hand, forcing you to piece together a complicated story involving betrayal, murder, and supernatural shenanigans. In the game, you play an insurance agent. A ship called the Obra Dinn, insured by your company, went missing several years ago. Now it’s mysteriously drifted back into port with no (living) people aboard. It’s up to you to figure out what happened with the help of a mysterious compass which allows you to see the moment of each person’s death. It sounds like it should be straightforward, but there were, at the time of departure, 60 people aboard the Obra Dinn, and no one is courteous enough to wear nametags. So that means whenever you go into the past, you have to figure out from contextual clues who each person is and how they died. More so than just figuring out individual deaths, the player has to figure out what the heck happened to the Obra Dinn in general over the several years the ship has been gone. Every character also has their own story they go through, some plot they were part of that led up to their death. Rarely will you find a boring, ordinary crewman aboard the Obra Dinn. Return of the Obra Dinn is hard. It’s the sort of challenge that can stretch your deductive reasoning to its breaking point, and you’ll still probably only reach some correct conclusions by process of elimination or blind luck. If you’re the sort of gamer who loves a challenge, this one will give you a run for your money. It’s also got a great way of telling its story. The heart of any mystery are the twists and turns you can take the audience on when you’re navigating to the truth, and the game gives you a particularly triumphant pat on the back whenever you manage to correctly determine a person’s identity and cause of death. Of course, it runs into the same problem that all murder mysteries in media runs into — there’s next to no replay value. At most, it might be worth going through again once, just to pick up on story beats you might have missed the first time. But that’s about it. It’s also incredibly methodical and slow-paced, on the level with most casual, hidden-object-style puzzle games. I know that’s not everyone’s cup of tea. The main reason Obra Dinn was a runner up to Battletech in my Best of 2018 article in the Puzzle/Strategy section was because the latter has more action and will last the player a bit longer, even if I personally preferred the former. For those who don’t know him, the game’s creator Lucas Pope is the guy behind Papers, Please, an oddly absorbing game that can best be described as a “red tape simulator.” That game, which starred a border control guard in a dystopian country, was subversively unconventional in that it didn’t sound like something anyone would enjoy. Obra Dinn isn’t quite as complex and different as Papers, Please, if only because there aren’t as many different outcomes and potential paths to the end (though you can, like Papers, Please, put the bare minimum of effort into your character’s job and get a special ending). But it makes up for that by being (and I think this bears repeating) pretty darned difficult. 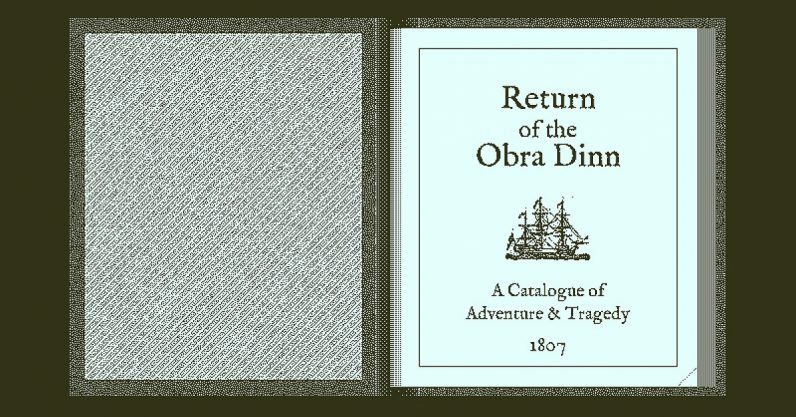 If you’ve got five or six hours to spare and aren’t interested in the battle royale du jour, then take a look at Return of the Obra Dinn.